Based on a report from SVERT the Tokyo VAAC reported that on 21 September an ash plume from Ketoi drifted NE. Gas-and-steam emissions were previously reported at Ketoi (figure 1) in January, July, and August 2013 (BGVN 40:09). Intense fumarolic activity originating from the same area, the N slope of Pallas Peak, was reported in 1981, 1987, and 1989. Based on a report from the Sakhalin Volcanic Eruption Response Team (SVERT) using Himawari-8 imagery, the Tokyo VAAC reported an ash plume on 21 September 2018 which drifted to the NE; however, evidence of the plume could not be confirmed by the VAAC from satellite imagery. The original VONA (Volcano Observatory Notice for Aviation) issued by SVERT noted a volcanic cloud without a specific mention of ash, but also remarked that thermal anomalies had been observed on 17 and 20 September. Figure 1. Natural color Sentinel-2 satellite image of Ketoi on 18 September 2018. A large freshwater lake can be seen SW of the Pallas Peak andesitic cone, which also hosts a crater lake. Lava flows originating from the younger cone extend primarily N to SW, and a white fumarolic area is immediately NE of the crater. The island is approximately 10 km in diameter. Courtesy of Sentinel Hub Playground. Information Contacts: Sakhalin Volcanic Eruption Response Team (SVERT), Institute of Marine Geology and Geophysics, Far Eastern Branch, Russian Academy of Science, Nauki st., 1B, Yuzhno-Sakhalinsk, Russia, 693022 (URL: http://www.imgg.ru/en/, http://www.imgg.ru/ru/svert/reports); Sentinel Hub Playground (URL: https://www.sentinel-hub.com/explore/sentinel-playground). SVERT reported that a possible thermal anomaly over Ketoi's Pallas Peak was detected in satellite images on 26 August and 1 September. The Aviation Color Code remained at Yellow. SVERT reported that a thermal anomaly over Ketoi's Pallas Peak was detected in satellite images on 12 August. The Aviation Color Code remained at Yellow. SVERT reported that a thermal anomaly over Ketoi's Pallas Peak was detected in satellite images during 5-7 and 9 August, and possibly during 10-11 August. Steam-and-gas emissions were detected on 9 August. The Aviation Color Code remained at Yellow. SVERT reported that during 29-31 July a thermal anomaly from Ketoi's Pallas Peak was observed in satellite imagery. Gas-and-steam emissions were also observed on 29 July, and possibly observed on 31 July and 4 August. The Aviation Color Code remained at Yellow. SVERT reported that on 25 July a thermal anomaly from Ketoi's Pallas Peak was observed in satellite imagery along with gas-and-steam emissions drifting 100 km NW. On 27 July gas-and-steam emissions possibly containing ash drifted 45 km SSE. SVERT reported that gas-and-steam emissions from Ketoi's Pallas Peak were observed in satellite imagery during 16-17 January. SVERT reported that increased fumarolic activity from Ketoi was noted in satellite imagery on 4 May. Intense fumarolic activity was occurring on the outer N slope [of Pallas Peak during the 20 September 1981 overflight]. There were sulfur deposits near the fumaroles. However, no apparent fumarolic or solfataric activity was observed at Zavaritski Caldera (46.925°N, 151.95°E) or Prevo Peak (47.02°N, 152.12°E). Both are on Simushir, the island immediately SW of Ketoi. Moderate fumarolic activity was noted on the outer N slope of Pallas Peak's main crater area during an 11 October aerial survey. During a 14 January overflight, a group of highly active fumaroles was noted on the N slope of Pallas Peak's S cone, on the E margin of Ketoi caldera. 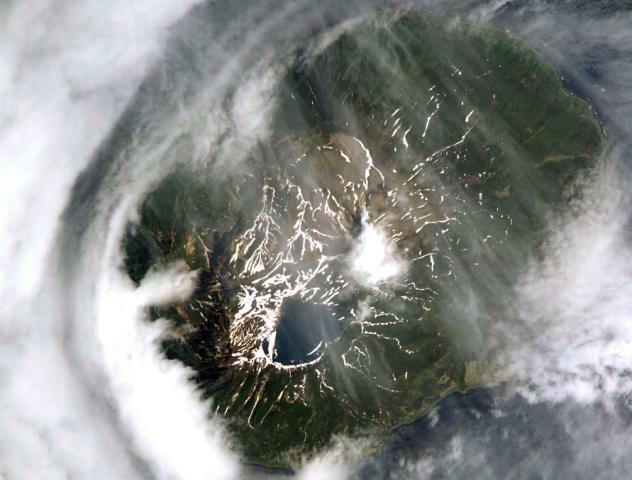 Pallas Peak, the large cone in the caldera on Ketoi Island in the central Kurile Islands, last erupted in September 1960. Scientists on monitoring flights during the 1980's sometimes observed fumarolic activity on the outer N slope of Pallas Peak (SEAN 06:12, 12:04, and 14:03), and the Sakhalin Volcanic Eruption Response Team (SVERT) reported increased fumarolic activity based on satellite imagery analysis on 4 May 2010. Gas-and-steam emissions from Pallas Peak were again observed in satellite imagery during 16-17 January 2013. On 25 and 29-30 July 2013 a thermal anomaly on Pallas Peak was detected in satellite data. Gas-and-steam emissions were also observed drifting 100 km NW on 25 July. On 27 July gas-and-steam emissions possibly containing ash drifted 45 km SSE. Though this eruption was uncertain, SVERT raised the alert level to Yellow. Additional gas-and-steam emissions were observed on 29 July, and possibly again on 31 July, 4 August, and 9 August 2013. Thermal anomalies were identified during 5-7, 9, possibly 10-11, 12, and possibly 26 August. After another possible thermal anomaly on 1 September there were no further reports of anomalous activity by SVERT. A copyrighted photo taken by Joseph Szeles from a ship on 15 January 2014 showed a small fumarolic plume rising from the caldera. 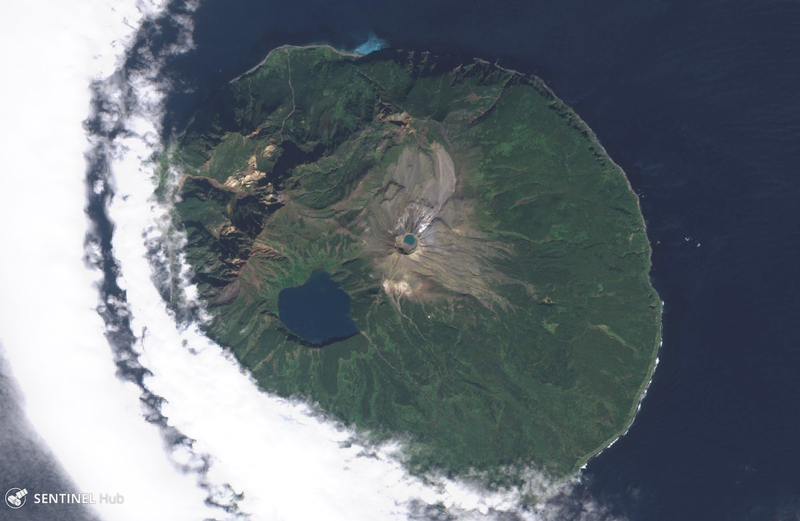 The circular, 10-km-wide Ketoi island, which rises across the 19-km-wide Diana Strait from Simushir Island, hosts of one of the most complex volcanic structures of the Kuril Islands. The rim of a 5-km-wide Pleistocene caldera is exposed only on the NE side. A younger 1172-m-high stratovolcano forming the NW part of the island is cut by a horst-and-graben structure containing two solfatara fields. A 1.5-km-wide freshwater lake fills an explosion crater in the center of the island. Pallas Peak, a large andesitic cone in the NE part of the caldera, is truncated by a 550-m-wide crater containing a brilliantly colored turquoise crater lake. Lava flows from Pallas Peak overtop the caldera rim and descend nearly 5 km to the SE coast. The first historical eruption of Pallas Peak, during 1843-46, was its largest. There is no Deformation History data available for Ketoi. There is no Emissions History data available for Ketoi. Clouds surround the circular, 10-km-wide Ketoi Island in this Space Shuttle view (with north to the upper left). A dark-colored 1.5-km-wide freshwater lake (bottom center) fills a large explosion crater. Above it and to its right, clouds drape the summit of Pallas Peak, a post-caldera cone with its own crater lake. The rim of a 5-km-wide caldera in the NE part of the island is visible at the top center. Lava flows from Pallas Peak overtop the caldera rim and descend to the SE coast. The first historical eruption of Pallas Peak, during 1843-46, was its largest. NASA Space Shuttle image ISS005-E-6024, 2002 (http://eol.jsc.nasa.gov/). There are no samples for Ketoi in the Smithsonian's NMNH Department of Mineral Sciences Rock and Ore collection. Large Eruptions of Ketoi Information about large Quaternary eruptions (VEI >= 4) is cataloged in the Large Magnitude Explosive Volcanic Eruptions (LaMEVE) database of the Volcano Global Risk Identification and Analysis Project (VOGRIPA).